Origin and Habitat: Cipocereus bradei is endemic to the state of Minas Gerais, Brazil in Serra do Cabral and west slope of Serra do Espinhaço. It is known from six localities which would represent two different locations (extent of occurrence of ca 13,000 km2 ). The populations are not very abundant, with between 50 to 200 individuals. Altitude range: It occurs between 500 - 1,200 metres above sea level. Habitat and Ecology: C. bradei occurs in south-eastern campo rupestre element, on crystalline rocks in campo rupestre, carrasco or cerrado, together with Arthrocereus rondonianus, Pilosocereus aurisetus, and the strong-spined Discocactus multicolorispinus. There is hybridization with other species in the same genus. There is habitat degradation from mining and intentional fires for the management of grasses, particularly in the western portion of the distribution of this cactus. Pilocereus bradei Backeb. & Voll in Backeb. Pseudopilocereus bradei (Backeb. & Voll) Buxb. Description: Cipocereus bradei is a shrub or treelike cactus forming several branches with black spines that quickly disappear as stems age. It is the inflated-looking, glaucous-blue, clavate stems that are most characteristic. The nocturnal flowers have pale petals which surmount fleshy tubes and develop into dark, globose fruits that appear intense glaucous blue by virtue of the thick cuticular wax covering the black watery pulp. Cipocereus bradei is quite floriferous, both in habitat and cultivation, and the flowers are a spectacular blue outside and white within. This species was originally described as Pilocereus bradei Backeb. & Voll and for a time was called Pilosocereus bradei (Backeb. & Voll.) Byles & Rowley. Derivation of specific name: The specific epithet honors the German botanist Alexander Curt Brade (1881-1971) of Botanical Garden of Rio de Janeiro, specialized in the study of the orchids and ferns of Brazil and Costa Rica. Stems: Club-shaped to cylindrical, sometimes slightly constricted, 1-3.5 m high, branched above the ground, glaucous blue when young, especially when stressed, later dull gray, 8-9 cm in diameter, quite vertical and almost like a smooth version of Euphorbia abdelkuri. Both the spines and the waxy cuticle tend to be shed as the stems mature. The stems seem to break rather easily due to the peculiar weakly woody vascular cylinder and the mucilaginous succulent tissues. Fertile part of stem not differentiated (lacking a cephalium). Ribs: 8-9(-11), about 1 cm high and to 2.5 cm wide, rounded in section, with transverse furrows between areoles. Areoles: Oval, up to 3 mm in diameter, felt short, at first white, becoming blackish, in age nearly naked, 20-23 mm apart. Spines: Variable, often absent on older stems. Spines on young areoles missing or few, if present, black or dark reddish brown, old areoles with 5-7 spines, porrect. Central spines: 1-2, sharp, black, directed downward or upward, to 2.5 cm long, later to 3.5 cm long. Radial spines: 4-5, brownish, to 1.5 cm long. Seedlings and young plants: Seedlings have more ribs (about 10) and areoles with dense reddish spination. Flowers: Flower-buds numerous, often from one side of stem near the apex, obtuse before anthesis. Flowers up to 6.5-8.0 cm long 3.5-4.0 cm in diameter; pericarpels and floral tubes dark glaucous blue ridged, glabrous except for scattered bract-scales. Outer perianth-segments 9-12 mm long, dark blue to purplish cream, inner segments 18 mm long, white or cream. Anthers 2.2-3.0 mm. Style 45-48 mm long, tapering. Stigma-lobes about 10, 9 mm long. Fruits: Globose, smooth, naked, intense glaucous blue, to 4,5(-5.5) cm x 3.5 cm, in diameter. Seeds:1.6-1.8 x 1.1-1.2 mm, brownish. 3) Taylor, N.P. (March 2011). "Cipocereus bradei". Cactus and Succulent Journal. 4) Zappi, D.C. and Taylor, N.P. 1991. Cipocereus. In: D.R. Hunt and N.P. Taylor (eds) Notes on miscellaneous genera of Cactaceae. Bradleya 9: 86. 11) Taylor, N.P. & Zappi, D. 2013. Cipocereus bradei. The IUCN Red List of Threatened Species 2013: e.T40880A2940229. http://dx.doi.org/10.2305/IUCN.UK.2013-1.RLTS.T40880A2940229.en. Downloaded on 21 September 2016. 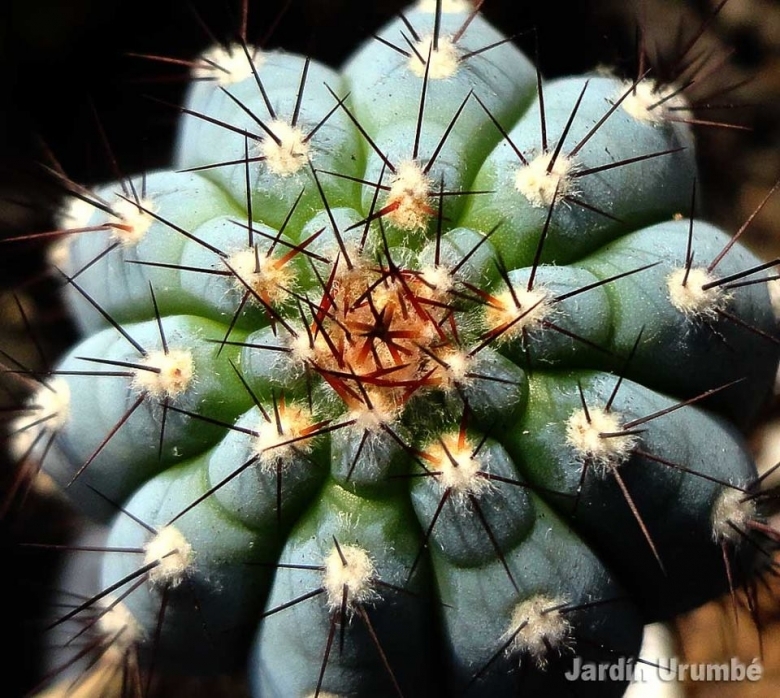 Cultivation and Propagation: In cultivation, Cipocereus bradei is probably the best known, despite having one of the most restricted distributions.